Write down the five things that are most important to you in the whole world. I’ll wait a moment while you do that…. If you are anything like me, your list may include values like independence or peace; it may consist of goals or aspirations, or people like your family or friends. But tell me, are YOU on that list? If you aren’t, how do you rank yourself in your priorities? 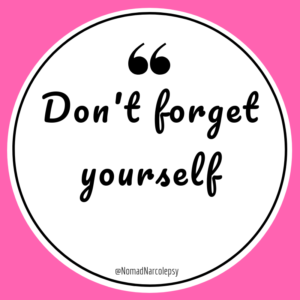 Do you feel like it’s selfish to dedicate time to love yourself? What if you made a gratitude list? If you had to rank the top 5 things you are grateful for, it’s possible you would be gauging the weight of options like health and career, but you might not even think of putting yourself in the running. So the first step toward loving yourself is to be aware of yourself. Begin to appreciate who you are and what value you have in the world. Think about who you are and what is most important to you. Do you put those things first or do you let others’ priorities push ahead of yours? Treating yourself as well as you treat others is one way of loving yourself. 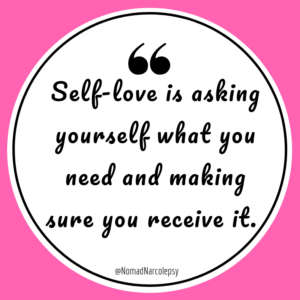 In its simplest terms, practicing self-love is asking yourself, “What do I need?” and giving yourself just that. It’s important to understand when you need to take the time to rest. It’s also important to see when you are ready for something more. If you know who you are, you know what gives you a sense of fulfillment. Do you make time for those things? Or do you let more mundane tasks get in the way, claiming you just don’t have time to love yourself? It can take a lot of effort to clear away the clutter. For example, I’ve found that publishing my writing gives me a great sense of fulfillment. However, I still struggle to make the time to write. Aside from the usual distractions like Instagram and Facebook, I manage to do a lot of things that don’t add value long term. Self-care rituals like doing my fingernails, or having a long bath are lovely, but I tend to use them to procrastinate on doing things that will actually create a lot more joy in my life. When I publish something, I feel enormous surges of positive energy that I don’t get from looking at freshly painted nails or plucked eyebrows. What are the things in your life that give you a real sense of purpose and fulfillment? If you want to find the time to love yourself, usually that means identifying what you are willing to give up. What sacrifices might you have to make if you want to create a gap in your schedule to put the things that express love to yourself? Maybe you don’t need an hour to scroll Facebook when you wake up, and you would be better off going to your favorite yoga class. Maybe you can give up lazy Saturday mornings in bed and go, volunteer, if that is what drives you. Whatever it is that will show you that you love yourself, figure out what you are willing to sacrifice to give that to yourself. Of course, everyone is different, and we also evolve as human beings throughout our lives, so we have to continuously check in with ourselves to know where we are on our journey. This month, I’m committing to 28 days of self-love. I plan to put myself first, and sincerely ask myself what I need and give myself that. I will take care of my mind, body, and soul. I’m no expert, and it will be a journey, so I’d love to hear your suggestions or stories of how you express love to yourself! Follow me on Instagram for self-love quotes all month long!